Steven Patrick Morrissey (born 22 May 1959), known as Morrissey, is an English singer and lyricist. He rose to prominence in the 1980s as the lyricist and vocalist of the band The Smiths. The band was highly successful in the United Kingdom but broke up in 1987, and Morrissey began a solo career, making the top ten of the UK Singles Chart on ten occasions. Widely regarded as an important innovator in indie music, Morrissey has been described by music magazine NME as "one of the most influential artists ever," and The Independent has stated "most pop stars have to be dead before they reach the iconic status he has reached in his lifetime." Pitchfork Media has called him "one of the most singular figures in Western popular culture from the last twenty years." 26 January - Morrissey hospitalized in Michigan due to "bleeding ulcer"
11 March - Morrissey hospitalized in California due to "double pneumonia"
After 17 concerts, the remaining 9 were cancelled due to Morrissey's illness that he claims was passed on by Kristeen Young in Miami according to a statement on true-to-you.net. Kristeen denied she had the 'horrendous cold' mentioned and claimed it was an "allergy attack that was over within 16 hours." ↑ 1.0 1.1 1.2 1.3 1.4 1.5 1.6 1.7 1.8 Morrissey Wikipedia page. Wikipedia. Retrieved from Wikipedia.org. ↑ Hand In Glove Wikipedia page. Wikipedia. Retrieved from Wikipedia.org. ↑ 3.0 3.1 3.2 3.3 3.4 3.5 3.6 Morrissey Discography Wikipedia page. Wikipedia. Retrieved from Wikipedia.org. ↑ 4.00 4.01 4.02 4.03 4.04 4.05 4.06 4.07 4.08 4.09 4.10 4.11 4.12 4.13 4.14 4.15 4.16 4.17 4.18 4.19 4.20 4.21 4.22 4.23 4.24 4.25 2014 Tour Dates True-To-You page. True-To-You. Retrieved from True-To-You.net. 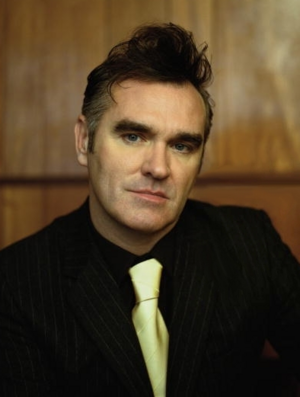 ↑ Morrissey statement on tour cancellation - true-to-you.net. morrissey-solo.com. Retrieved from morrissey-solo.com. This page was last modified on 27 June 2014, at 10:57.